Redeemed Despicable Me 2. Thanks! Got my shipping notification @ $224.99! Was $244.15 after tax. Bought 2, how do you do the "Where is my cash?" on eBates? You may have to wait a day or more before you try to claim. eBates says Belk's processing time for cash back is 14 days. I'll post back when I get a cash back notification on either of my orders to let everyone know how long it took. EDIT: Forgot to mention you can get 8% back through eBates! EDIT EDIT: Better code. Said code was invalid when used w/ the Switch last night, works today. Go figure. Thanks, sharpeone! 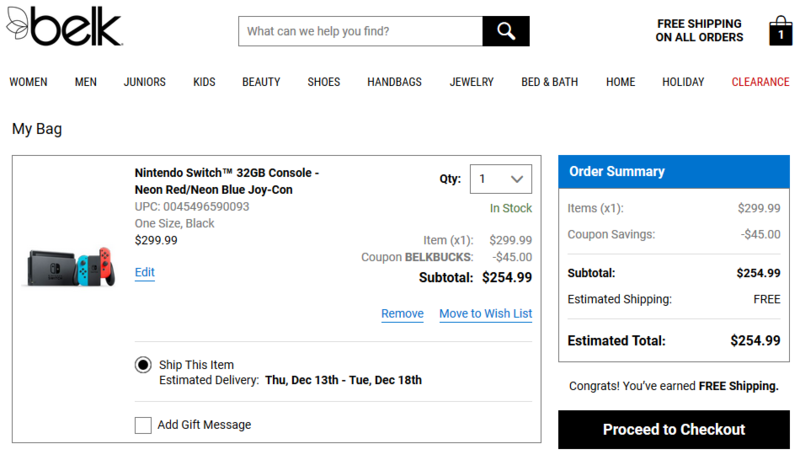 You can get a Nintendo Switch (red/blue) shipped from Belk.com for $224.99 $254.99 + tax using code 34671199 BELKBUCKS. The code takes $15 off for every $75 worth in your cart, so that's $45 off a Switch. If you can find something to kick another $0.01 into your cart, you can bump the $45 off up to $60. There's a few items of clothing for toddlers and women from $0.99-1.99. That'll lower it to a potential $240.98 + tax, shipped. Congratulations, you uncapped a VUDU* code! Thanks! Used the one I quoted. I got that VUDU code! Thanks, ransack! #14005919 Steam Code Drop ~ NO BEGGING! NO TRADING! Drat. Too slow for Anna's Quest. Thanks for the generous drop! Don’t know if this code works but go for it and try folks. It did indeed work. Thanks! Prismata is currently free (to keep) on Steam. Offer expires Monday May 21st 10AM PDT. Clicking Install Game should be enough to get it registered to your account. I posted that deal 3 posts above yours, but it's all good. At least someone else is trying to keep the Android thread alive!